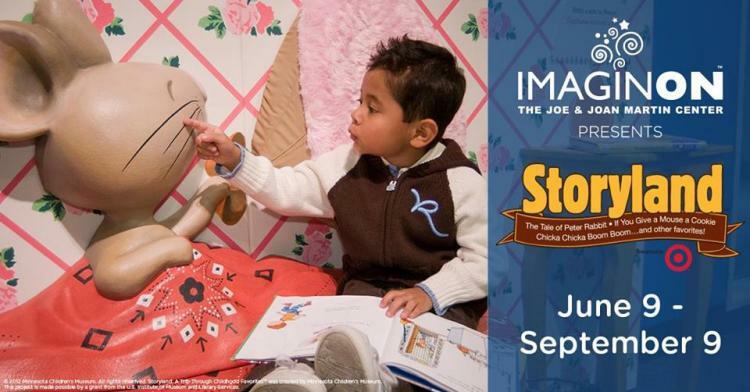 Beloved children’s books will come alive with "Storyland: A Trip Through Childhood Favorites," an imaginative, book-based experience for children ages birth to 8 years old, at ImaginOn from June 9 through September 9, 2018. Admission to the exhibit is FREE. Tickets and reservations are neither required nor accepted and entry into the exhibit is always on a first-come, first-served basis. However, if you wish to combine your visit to the exhibit with any other building-wide activity and have a group, a group visit booking is required (visit imaginon.org for more details). The exhibit is open at ImaginOn (300 E. 7th Street, Charlotte) during building hours: Monday-Thursday from 9 a.m. to 8 p.m., and Friday-Saturday from 9 a.m. until 5 p.m. ImaginOn is closed on Sundays from Memorial Day to Labor Day for summer hours. The exhibit will be at ImaginOn from June 9 to September 9, 2018. For more information, visit click for details or call 704-416-4600. The "Storyland: A Trip Through Childhood Favorites" exhibit was developed by the Minnesota Children's Museum, and is presented by Target.